Publius Ovidius Naso was born in 43 BC, in Sulmo (modern Sulmona), in the rugged mountains of the Abruzzi about a hundred miles from Rome. His family, which must have been locally prominent and relatively wealthy, were Roman citizens of equestrian rank, and seem to have intended Ovid for a political career in Rome. Ovid was a conspicuous success as a student of rhetoric at Rome, went on a tour of Greece, and held at least one minor magistracy in Rome, before turning to poetry as a full-time occupation. He married at least three times, and had a daughter and two grandchildren. In AD 8 he was banished by Augustus to the remote Greek city of Tomis (modern Constantsa), on the Black Sea coast in what is now Romania. 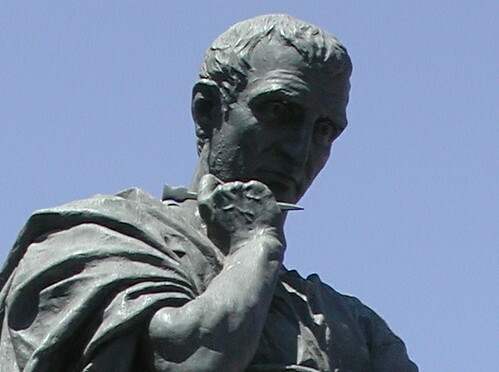 According to Ovid there were two reasons for his exile: his Ars Amatoria had given offense, and he had committed a mysterious error, perhaps connected with the imperial house (Augustus' granddaughter Julia was exiled for adultery in the same year). Despite much pleading Ovid was never allowed to return from Tomis, and died there in (probably) AD 17.
were originally published in five books, but were subsequently republished in the edition we now have, in three books, sometime after 16 BC. His other early works, all largely concerned with love affairs and/or women, are difficult to date precisely, and no doubt overlapped with the writing of the Amores: the Heroides is a collection of letters written by fictional heroines; the fragmentary Medicamina Faciei Femineae concerns female cosmetics; the Ars Amatoria is a didactic poem about how to conduct love affairs, and the Remedia Amoris is about how to end them. Ovid's greatest work is the Metamorphoses, an epic poem on mythological transformations. He also wrote the Fasti, concerned with the religious calendar, and the Ibis, an invective against an unnamed enemy. During his years of exile he wrote the Tristia and Epistulae ex Ponto. Two lost works are a drama, the Medea, and a translation of Aratus' astronomical poem, the Phaenomena. All his surviving works except the Metamorphoses are in elegiac couplets. Image: an imaginary likeness of Ovid, statue standing in his birthplace, Sulmona, Italy. Photo: Bill Jennings.